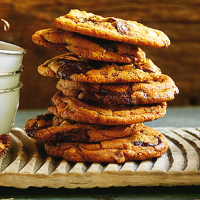 Named for the ice-cream scoop used to divide up the dough, these cookies are unbelievably delicious. Do wait for them to cool and firm up properly before transporting anywhere. For a crisper cookie, bake a little longer. Preheat the oven to 180°C/gas 4. Beat the butter and sugars together for 2 minutes, until light and fluffy. Beat in the egg and vanilla extract. Sift the flour, bicarbonate of soda and baking powder together; scrunch the salt over. Stir into the egg mixture to form a dough. Stir the chocolate and hazelnuts through, cover and chill for at least 2 hours or up to 3 days to firm up. The flavours will deepen over time. Line a large baking sheet with non-stick baking paper and use an ice cream scoop (or a soup spoon) to form balls of cookie dough. Space these spheres out well – 6 in a batch is about right as they will spread – and bake for about 15 minutes, until pale golden. Leave to firm up on the tray for a few minutes, then transfer to wire racks while you cook the next batch.